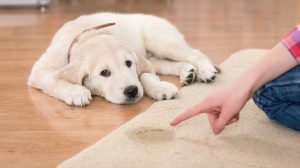 Housebreaking a young puppy is behavior priority number one upon bringing your new furry family member into your home. Nothing is probably more frustrating then a dog that isn’t 100% housebroken after months of effort. At only 8-9 weeks of age, your puppy is not yet physically capable of avoiding potty accidents on their own. Patience and persistence is a must. The puppy is 100% dependent on you to teach them housebreaking skills, therefore, knowing the steps is critical to your dog’s success. You’ll need the following to assist with housebreaking your puppy: an appropriately sized crate with adjustable divider in it, paper towels or rags to clean up accidents, “Natures Miracle” enzymatic cleaner to effectively clean up after accidents (other products are not typically successful in removing the scent left behind that may trigger a dog to go potty in that same area again; the only brand I recommend), a leash and collar. 4) Teaching them where to go AND where not to go potty. How fast a puppy becomes fully housebroken varies from breed to breed, but generally the larger the dog breed, the easier and faster success will happen. Toy breeds are the most difficult to housebreak and take great patience and consistency on your part. Generally speaking, most dogs should be housebroken by 4-6 months of age. Dog’s not housebroken by 1 year of age are likely not going to become housebroken, but at least give it a 3-4 month effort before claiming defeat. Working dog owners: you have a bigger challenge and will need help from others with your puppy while you are at work during the early months of your puppy’s life. 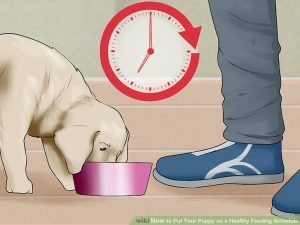 ♦ Put your puppy on a feeding and watering schedule (don’t restrict water intake, just schedule when they have access….every 2-3 hours during the day is fine). √Initially take out once overnight, but by 12 wks old most should be able to sleep through the night. Crate no longer than 1 hour for each month of age at a time (except overnight). Crate should be just big enough for the puppy to stand up fully, turn around, lay down comfortably to support their instincts to not soil their sleeping space. ♦ Attach a 4’-5’ long light weight leash to your puppy’s collar to drag around while supervised. This is helpful in not only getting them used to the leash and to stop them in their tracks if they run off with something (step on leash), but if they are showing they need to potty, you can grab the leash and quickly lead them to the potty spot you have chosen. 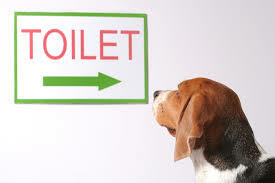 ♦ Decide if you want your dog to eliminate outside or if indoors on a potty pad. 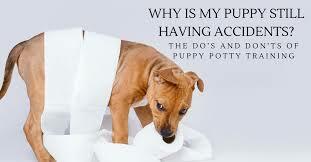 *Do not pad train a large breed puppy to a potty pad initially and then try to change to outside. Only use potty pads for ♦exclusively indoor toy / small breeds. ♦ Choose a single specific location outdoors for your puppy to go potty each time and stick with it. (toy breeds: place pad in an easily accessible area for your puppy –have one for each room you spend time in with him/her initially, then gradually move to having 1 or 2 locations as they gain more bladder/bowel control while active. ♦ Take the dog out or to potty pad on-leash (helps them to stay focused and good skill to have). 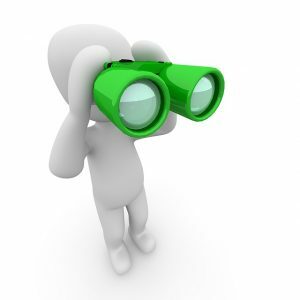 ♦ Give a short phrase as a command to eliminate (“go potty”, “do your business”, etc). Choose one and stick with it. ♦ As soon as puppy eliminates where you want them to, mark that behavior with an enthusiastic “yes!” as soon as they finish. Follow that with a treat or praise/affection to reinforce going potty in that spot. ♦ If your puppy doesn’t potty within 10 minutes, calmly put them in their crate for 10 min. and repeat the process until they eliminate. Confining them to the crate will prevent accidents elsewhere. Don’t forget to teach your puppy to NOT go potty anywhere other than where you tell them to go. ♦ If you catch them in act of going potty in the wrong place, interrupt them by clapping your hands as you say no! then whisk them to their designated potty place and give them the command you’ve chosen. ♦ If you find an “accident” later, calmly bring the puppy to it (within a few inches) and with the free hand slap the floor a couple times next to the urine or feces and scold saying “No!, No Potty here!” and then take them to their designated potty place and give the command you have chosen. They may not go, but they will have already associated the place you take them to with eliminating there. This teaches them that this is the only place at home you want them to go. They have to develop physical control first, before they have an opportunity to be successful pottying in the right place. **NEVER rub your puppy’s nose in his/her waste EVER!! You also don’t want to scold or discipline harshly for housebreaking accidents. ** Housebreaking requires much patience, persistence and consistency on your part!